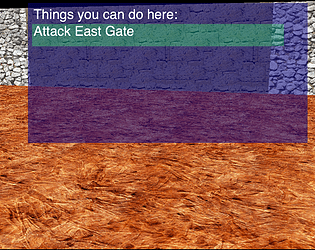 Make your way through a maze by playing match 3 puzzles. We wrote a match 3 puzzle, in which cyclic swaps are an important part. The idea is pretty unique I think, the cycle part is through rotating the diamonds to achieve the clear, it's creatively combining the theme cycle and PZQ. Thanks for your contribution, waiting for your final version. This looks like a good start for a bigger game if you feel like making it. It would need something more game-like though, such as a way to fail at the match-3 game or something unlocked by doing it enough. I'm not sure if there's an ending, since after a while of going through rooms and doing rounds the game crashed. There's a couple things wrong that could use fixing if you have the time: 1. the instructions at the menu are fed to the player way too slowly. I can see that presentation potentially helping players who are younger or just generally not good with consuming information quickly, but for someone used to reading a lot, it just gets annoying. 2. the rotation and movement during the 3d sections shouldn't be linear. Having the character just move a set amount per button push gives an impression of extremely high acceleration that makes the game more likely to nauseate people who are sensitive to motion.